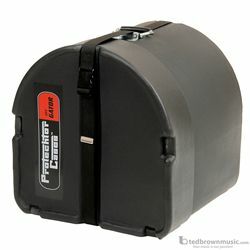 Bass Drum Case Classic Series, with Wheels; 22" Wide, 18" Deep. The rotationally molding process gives added strength and durability to case corners and provides water resistance that non-roto molded cases can't match. Optional 1/4" thick interior foam lining not included.